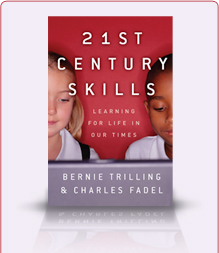 The need to teach 21st-century skills has emerged in our collective consciousness as a key paradigm in education. For the first time since the advent of public education, there is growing consensus for the need for K-12 schools to teach for skills, not merely for knowledge. This has been prompted and amplified by changing economic pressures at both the macro level (globalization, thus increased competition) and the micro level (the dissolution of workforce stability). When we explore 21st-century skills, I must state emphatically the need to also lend a watchful eye to curriculum design. It’s not enough simply to add 21st-century skills to the already-burdened curriculum; we must reprioritize our core curriculum based on what is relevant to society today to produce career- and college-ready graduates. Relevance means applicability and significance of what is taught. Today’s students are sophisticated learners who are best served by subject-matter content that applies real-world, everyday needs. Using real-world applicability as a benchmark, many current core disciplines have too much of a theoretical bias. For example, we continue to insist on geometry and algebra as core curriculum subjects, but perhaps there are other disciplines that should be taught more universally. Consider statistics and probability: In the modern world, statistics and probability are a branch of mathematics that has perhaps the most daily-life applicability—nearly everyone requires a basic understanding of data to be successful, from doctors to journalists to lawyers to politicians … to the person on the street—but it’s not taught until high school, and even then only if students select the course as an elective. The same situation persists in college. Looking beyond math, why is there so little focus on technology and engineering? 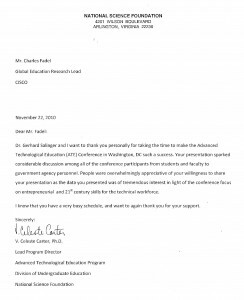 Given the current socioeconomic climate, this can only be described as an oversight that runs counter to common sense, given the crying demand for science and engineering talent worldwide. But perhaps historical inertia is the deciding factor when it comes to curriculum design. Decisions are made by subject-matter experts; e.g., math decisions are made by math experts in near isolation from the demands of the real-world—and tend to take an incremental approach – which often involves abstract concepts rather than practical topics – weighed by history and poorly informed of modern needs. There is also no process in place to ensure that curriculum is tied to real-world needs of learners, let alone to 21st-century skills. If we really want to see positive change, we need to defuse resistance to change and redesign the curriculum from the ground up. Academia needs to look beyond its ivory tower into the real world, to design curriculum that, in addition to educating citizens, fits practical socioeconomic realities, as well as the learning styles of the growing population of digital natives. As an education leader, what disciplines do you feel could best benefit from reprioritization and rebalancing? What would your ideal curriculum program look like?